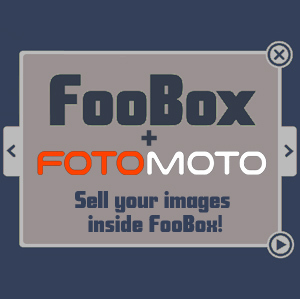 Yesterday we released the Fotomoto FooBox extension plugin for WordPress. This is an addon plugin for our popular FooBox media lightbox plugin and allows you to insert your Fotomoto purchase links directly into the FooBox lightbox modal window. This is one of those plugins that came directly from user requests. We’re thankful to have such passionate and committed users of our plugins, especially FooBox. A large section of our customer base are photographers and artists who have found that FooBox allows them to display their images and make them easily sharable like no other lightbox on the market. Not to mention one of the main features of FooBox in that it’s fully responsive and makes their images look awesome on device screens of all sizes. The main request we kept getting was to build eCommerce functionality directly into FooBox, but as you can imagine, building that from scratch would have been a large task, not to mention a whole other business model we didn’t want to pursue directly. So we started looking at existing photo sales services. There are several. Why did we pick Fotomoto integration? I honestly don’t remember, but I think it was because a happy FooBox owner asked on one of the Fotomoto company support threads. From there we ran with it. We have a few extensions for FooBox now, but the Fotomoto extension is the first one that integrates with a service that can help one’s revenue grow directly. Because this extension has already been a success (yes, in just one day since being available), we’re already strongly considering integration with other services that photographers and artists are using. What image, photo, or other services would you like to see integrated with FooBox?